That creaking, clanking noise you hear faintly—so faintly—is the sound of the 2016 presidential election rolling inexorably in our direction. But right now much of the action is centered in Iowa, where, FYI, Republican senator Joni Ernst (who first came to our attention with an ad proudly touting her hog-castration experience) just held a barbecue and motorcycle rally for GOP candidates looking to sweet-talk Iowans before the primary. And so let the spectacle of Republicans bending over backwards to out-down-home each other commence! Pork and beans served from tin bins onto Styrofoam lunch plates, bales of hay stacked as a backdrop on a Potemkin farm used to demonstrate equipment at the annual Farm Progress Show. 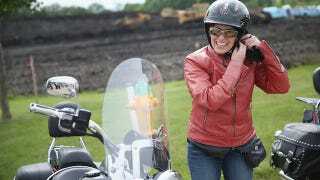 Hundreds of participants arrived en masse; Ernst led a pack of 300 bikes to the farm grounds, with Wisconsin Gov. Scott Walker right behind her. “I love a Senator who knows how to castrate a pig, ride a hog and cut the pork from Washington, D.C.,” said Walker, bedecked in a black Harley-Davidson T-shirt and ball cap. It was Ernst’s political carnival and the White House hopefuls were her performers. One by one, they took their turn on stage, standing in front of a metal barn festooned with a sign proclaiming Iowa is the “Fields of Opportunities.” Shame was verboten and pandering was rewarded. Ben Carson also wore a sports coat, but removed it before taking the stage. (Just shedding this jacket to get the job done, don’t mind me!) He looked less like he’d catch you in the fellowship hall after Sunday services and lecture you about your hemline, which is something, at least. “Khakis will be fine, right? Right? Khakis are okay? Khakis? Khakis are crisp, right? Are we sure the khakis will work?” — Marco Rubio. Rick Perry didn’t wear khakis. Rick Perry wore jeans. Dress pants are for effete Washington insiders. But Scott Walker’s such a Washington outsider he’s never even heard of Brooks Brothers, you get me? He rode in on a motorcycle, by the way. Did everybody get pictures of Scott Walker on his motorcycle? I’m pretty sure he’ll make another pass on the motorcycle, which he rode, like a cool dude, if anybody missed their shot the first time. Just a politician chilling out on a motorcycle.